Parabolics stops resemble a parabola (hence the name). The system allows for the market to react for the first few days after a trade is initiated and then the stop begins to move more rapidly. This makes the stop a function of price AND time. The two variables in the formula: AF which stands for "Acceleration Factor" and EP which stands for "Extreme Price". The AF begins each new trading cycle at .02 and increases by .02 each time a new high or low is made in the cycle until it reaches a maximum of .20. For the first day of entry (after you have reversed direction) the SAR becomes the EP. If your new trade is a "Long" then the EP is the lowest low achieved in your previous short position. If your new trade is "Short" then the EP is the highest high achieved in your previous short trade. As the trade develops, the EP and AF are adjusted if and only if a new high is made in a long trade or a new low is made in a short trade. The Parabolic System works best during strong trending periods, which Wilder referred to a "directional markets". He recommended using his own Directional Movement Index (DMI) to determine the strength of the trend. 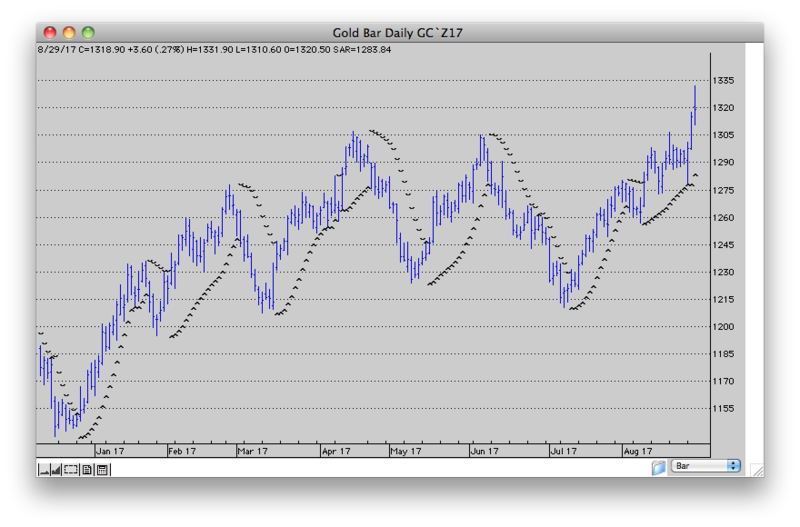 Gold chart illustrating parabolics stop and reverse system created by Personal Hotline from Trendsetter Software, exclusively Mac.